As presidential candidate, Walker offers bellicose policies that would provoke Russia. Gov. Scott Walker. Photo from the State of Wisconsin. It would be a big mistake to dismiss the presidential primary debates and campaigns as a circus. One of those 20 candidates for the GOP and Democratic nominations is going to have his or her hand on the red phone. Despite the manic veneer to the recent GOP “debate,” generated to a great extent by the egotistical riffs of Donald Trump and gotcha questions from the Fox News panel, the Republican leaders offered important clues on how they would act if elected to the oval office. But you have to listen hard, because campaign statements can be so scripted and opaque that they mislead or fail to inform voters on their real beliefs and intentions. Take the track record Gov. 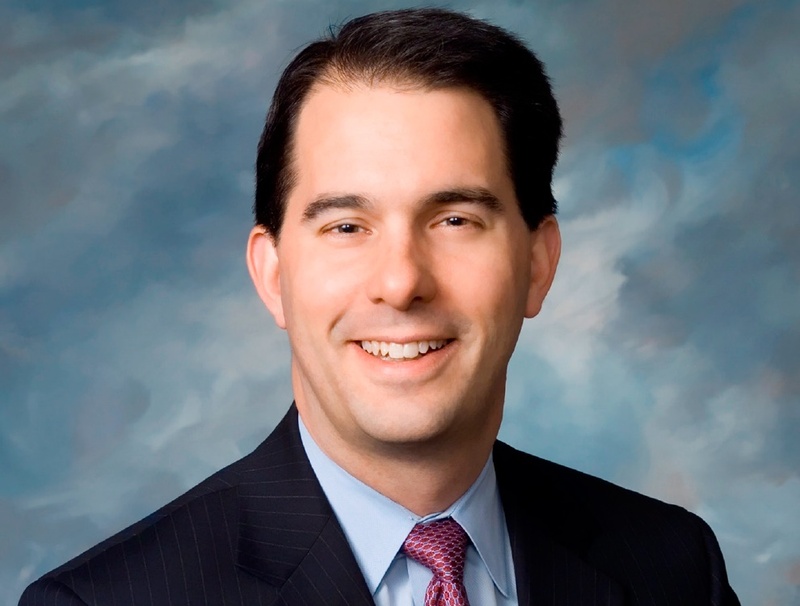 Scott Walker of Wisconsin, for instance, as a candidate for governor three times: he always said he would reduce the size of government, cut taxes and balance budgets. He has balanced the state budget (though not by business accounting standards), he has cut taxes a little, and he has cut the size of government by a smidge. Job creation was at the center of his three campaigns, but once elected that overriding issue took a back seat to anti-union measures (Act 10, right-to-work law, and a reversal of prevailing union wages on local government construction projects) and to social issues (voter ID, abortion, drug testing for entitlement, voucher schools). Partly as a result of lack of focus on job creation, his administration got about half way to his goal of 250,000 new jobs in his first four years. Other states like Ohio have done better. The decades-old pattern of slow job and business growth in Wisconsin tied Walker’s hands on cutting taxes in a major way. That, plus soaring health costs to state employees and Medicaid, put his budgets in semi-permanent crisis. So, sometimes Gov. Walker does indeed follow through on what he says on the campaign trail; sometimes not so much. Walker’s record also demonstrates that what the candidates don’t say can be more important. Candidate Walker in 2010 never telegraphed his massive push-back on public unions. But Act 10 became his signature initiative in his first term. His recall over passing that law propelled him to national attention. It is the theme of his book “Unintimidated.” Yet no one except for a handful of his advisors saw Act 10 coming. Similarly in his 2014 campaign, he did not signal his intention to cut conservation and park programs and resources, to rewrite the “Wisconsin Idea,” to attempt to quarantine some government documents, or to slash the budget of the University of Wisconsin System. So, even if you listen hard, you don’t always know what you are going to get from the candidates once elected. Nonetheless, there are important directional road signs in hard-fought campaigns. Point in case: Walker amplified his hard right line positions during the Fox Q&A. He had already pivoted to the far right on abortion, immigration, gun control and the environment. In this leg of the race, he went hard right on defense and foreign policy, not his areas of expertise. He called for ripping up the Iran nuclear deal on day one of his presidency, for sending weapons to the Ukraine, for rebooting the anti-missile defense system in Poland and the Czech Republic, and for putting NATO troops on the eastern border of Poland and in the Baltic nations. All of these moves would provoke the Russian bear under President Putin. He is open to more U.S. boots on the ground in Syria. You may put down those provocative comments to rhetoric for winning a GOP primary, but, remember, Walker sometimes follows through on what he says on the trail. He sounds, despite his calm demeanor, like he would be a bellicose president. His remarks play to his “unintimidated” theme. Develop full support of American people, whose sons and daughters pay the price of war. That means an Act of Congress. Avoid nation building unless prepared to stay for decades as in Japan and Germany. Wouldn’t you like to hear some of these cautionary thoughts amidst the sound bites coming from the candidates trying to impress the right wing of the GOP? The man compared the deal w/ Iran to leaving teenagers alone in a bedroom. Maybe not talk about foreign policy for a while, at least until you’re done receiving your “Middle Eastern Affairs for Dummies” lessons? Walkers war mongering is the reason I would never vote for him. He seems like he would go to war on principal rather than dire need. AS a disabled combat veteran of the war in Vietnam, sometimes I think what the problem with our current crop of so called political leaders is their lack of knowing what it’s like to be afraid. Their notion of war is a computer simulation. Maybe I’m way off the mark but remember it was a combat vet (John Kerry) who led the negotiations with Iran and I just keep coming back to how that must effect his concept of working for an agreement as imperfect as such always are. Walker and the rest seem to be stuck on this “American Exceptionalism” as though that excuses all our foibles and we can then ignore the realities of the world. I think any foreign policy discussion should next take place in front of the Wall and begin with a brief explanation of what those names symbolize and how each is not simply a name but a husband or wife, son or daughter, mother or father and ask some of us who help carry their body bags to the choppers for the ride home to ask the questions. As the song asks “when will we ever learn”. The deal Kerry and Obama made is bad and does nothing but enable our enemies. PMD, I’m still waiting for your answer on why you support it, have you come up with anything yet. Ah yes more fear-mongering from a chicken hawk. You and Walker have a lot in common Paul. For starters, here’s why I think it’s a deal worth supporting. So now why don’t you tell me why all those scientists and retired generals & admirals are wrong. Any deal that openly allows Iran to get nuclear weapons AND is lacking a secure ability to perform inspections when and where they are needed to prevent Iran from “cheating” is a bad deal in my book. One of the scariest things to me on the world stage is Iran having a nuclear bomb. In addition to the nuclear bombs, the agreement removes sanctions for Iran’s missile programs which will have a disproportionate affect on their ability to counter any aggression and thus emboldens them to continue and expand their “war by proxy” strategy that they’ve taken on in recent years. Basically, this means we could have to deal with a much more “belligerent” Iran that causes a lot more trouble in the Middle East than they already do. I’m not thrilled with anyone having a nuclear bomb. What’s a better plan AG? I’m dying to here it. @Ag isnt the opposite true of this agreement? How does it openly allow Iran to get nukes? @Ag Sanctions for the missile program or just sanctions in general? So you are saying the fact Iran can better counter an attack will lead them to become more aggressive in their use on the offensive? What facts do you have to back that up? After 10 years there are no restrictions to Iran pursuing nuclear weapon R&D. 15 years is the restriction on processing uranium. History, their own statements, and understanding the mindset and tactics of similar regimes. @PMD First, No Nuclear Weapons For Iran. Second, why does a middle eastern country that’s rich in energy resources (oil, solar, wind) need to pursue Nuclear energy to begin with? However, even if you accept them having nuclear power there are other options like having a nuclear partner, say Russia for example, refine their fuel. Besides, nuclear energy is a farce… they wouldn’t enrich uranium to 20% if they just wanted it for energy. This is all about the bomb. The real problem is that the bomb exists & truth is the only control that truly exists is of ones self. Man is going to destroy the world because they can’t let others alone. WHO the hell died & said the US is in charge of everyone & everything. It’s one of the main reasons that countries don’t like the US. They talk all about democracy,freedom ect. but, want to dictate to everybody else. If you can’t see the hypocrisy in that then you will never have a clue. I’m with tomw the so called leaders need a damn reality check DAILY of where all this leads to. I personally think if a country wants og to war against another then it should just like a boxing match. The rep for each country has to fight the other in a boxing ring. Think of all the money & lives that would save. A thoughtful article. Walker’s bellicosity seems to me much more a function of attempting to appeal the Republican base than the result of any thoughtful study. No nuclear weapons for Iran. Is that supposed to be a comprehensive plan? That’s just a statement. PMD, it’s at least a statement that tells them we are against them getting weapons instead of this Obama plan that enables them. Self inspections are a joke . @A busdriver, the US is not in charge of everything and everyone. However, when our enemies who regularly express a desire to wipe us and our allies off the face of the planet (their words) have the ability to build a weapon capable of carrying out their threat, I think we should be involved. Iran may not be able to send an intercontinental ballistic missile to the US, but they could certainly send one to Israel or Saudi Arabia. Just as important, if not more, is the emboldened stance they’d be able to take if they felt they had strong enough deterrence capabilities. Just look at how provocative they are now in their current state without nuke’s and ballistic missiles. Paul I’m sure you think Obama is going to hand deliver Iran a nuclear weapon and tell them to do with it what they will. People like you are reflexively against every single thing he does. You’d criticize him no matter what. But weren’t there no sanctions prior to us implementing the (now removed) sanctions a few years ago? If after ten years, we determine that Iran is pursuing nukes why cant we re-implement stricter sanctions? Nowhere does it say we are no longer allowed to implement sanctions, correct? If you could point me to Irans history and/or statements concerning emboldening them to continue on the offensive becauyse they would be stronger on the defensive I’d love to see them. I have yet to see that. Using the “similar regime mindset” argument doesnt hold weight for me. PMD, self inspection is basically handing them a weapon, they have already met with North Korea and Russia on missile production. As soon as Obama does something good I will back that plan. A Busdeiver… did you seriously just cite a holocost denier to demonstrate your position? I even skimmed the article… there is so much fact twosting, false suppositions, and outright false information I could hardly believe what I was reading. That does not diminish some bad decisions by US leaders in the past… but it does nothing for this conversation for anyone who knows their history and even a smattering of foreign affairs. You are as ridiculous as what you think the article is “It would be inaccurate to call Chomsky a Holocaust denier. Chomsky knows the Holocaust took place, and he has repeatedly called it “the most fantastic outburst of collective insanity in human history.” But there again you missed it. First, if you are going to quote someone, cite it. Second, try not to quote from blogs or articles that directly refute what you are saying and making it conform to your stance by taking things out of context. That whole piece by George Jochnowitz that you quoted basically said that even if he acknowleges the holocost may have happened that he is still basically a deniar because its reasonable to conclude it hadnt AND/OR that its ok for people to conclude that even if jews were killed that it could be justified because they are evil. Not to mention Pol Pots genocide that he fully denies no question. I way over simplified that, but we are getting way off track. My point is, dont cite a radical to back up your arguments, it only makes you appear a radical as well. Paul is there a plan out there you like? I’d love for you to share it, or your own. You and AG bash Obama and the plan yet neither one of you have said what we should be doing and how we should deal with Iran. Makes one think you have no idea whatsoever. I thought I did? No nukes for iran period. Block the ability to refine nuclear material. Worst case, if they really want nuclear energy, foster a partnership with a sponsor state who can provide the material and collect it after use. As for stoppong them, continue sanctions, continue covert actions (computer virus that ruined centrifuges was so 007, I was impressed), and worst case be ready to use military strikes against nuclear sites. Of course end all of that as soon as they agree to never persue nukes and gives UN full unfettered access any time to prove it. Ag so you’re willing to sacrifice American sons, daughters, wives and husbands rather than approve of the current deal? Americans should be that paranoid that another nation will nuke them if they do indeed succeed in creating a bomb? Your concern might better be directed towards Pakistan who is much more unstable than Iran. Sorry I didn’t really think “don’t let Iran get a nuke” was a comprehensive plan. I figured you’d be easily able to expand upon that. Casey, you must always be willing to use your military if it’s going to mean anything. This does not mean we should rush off to war at any time. I was entirely against Bush’s invasion of Iraq for example. However, I believe there are military means to deal with Iran that put minimal US lives at risk. The payoff is that we have no fear of Iran killing millions with a nuclear weapon… ever. I’m not sure what makes American lives so much more important than an Israeli, Saudi, Iraqi, Jordanian, or even Iranian’s. Millions of those would be put at risk if Iran has the bomb. I’m not very concerned about Iran being able to Nuke the US, I’m concerned about them nuking their neighbors or other provocations that could pull the region into even more fighting. I also agree that Pakistan is a HUGE worry as well. Mostly due to worrying about how secure their weapons really are in a region rife with radicals who’d love to get their hands on them. PMD, did my last post go in depth enough? That’s a very bold statement you made, which I would love to hear you attempt to explain. My guess is neither your nor any of your family would be part of that “minimal” number. You say that to a group of Americans while hoping to use the American army. That makes American interests more important. So you are cool with us invading but are scared of pulling the region into more fighting? Interesting logic. Thats a bold statement, please explain how that would be. My guess is neither you nor any of your family would be part of that “minimal” number. If you are trying to convince Americans that using the American army and American citizens is needed, than American interests are in fact more important. So you are scared of more fighting in the region, so you advise an invasion to stem more fighting. Interesting logic. Wil, you must appreciate that comments on Urban Milwaukee are not exactly like giving a dissertation on a topic. Regarding your other thoughts on military action, there are a range of options that are a far cry from putting people on the ground in Iran that indeed put a minimal number of lives at risk. The least of which are guided missiles and airstrikes on specific nuclear targets. To get into the full range would take more than a comment on a blog or press release. As for American interests, since we’re giving our own opinions here, that’s what my statement was. My opinion is that one life is no more/less special than any other. That is a consistent stance I take over a broad spectrum of topics. The American First opinion seems quite contrary to many stances that some people take on other topics. I think prosperous countries have a real opportunity to help make the world a better place for those less fortunate. The realities of that are quite complicated… but sometimes the opportunities are more obvious than others. If your goal is to dismantle the nuclear facilities these forms of weaponry cant work because the facilities are buried beneath mountains. they literally cant be bombed. It is implausible to use airstrikes so 100% ground troops are needed. If you thought Iraq was bad, Iran would be way, way, way worse. If that were true than there are so many other more urgent things USA should be spending there time, political clout, and money on, the list is too long for me to even begin. If that is how you feel then you should think we should negotiate with Iran ASAP and then proceed to help others who were injured by non political actions, see earthquake in Haiti where the people are still suffering with no USA aid in sight. You’re right. And with the money thats been spent on the Middle East since 9/11 we could have cured human hunger. And yet, even with that stance I quoted above, you still push to double down and spend more money on war. Because you are not willing to just come out and say that, you are reaching for straws and inevitably come out with a bad argument. -I agree there are many causes we as a country should be involved in. Even more, all prosperous nations should be involved with. -I’m all for further reducing world hunger. That doesn’t keep the Middle East from being a hotbed of war, terrorism, and violence. You think wrong Will, very wrong. Why does everyone on here lately only read what they want to read instead of what people actually write? Here’s a radical foreign policy…let’s just stay the f*** out of the middle east. Let them all hash it out them selves and we can save hundreds of billions of dollars a year and probably be much less despised by most of that region if we did so. We’ve never needed the middle east less than we do now in at least a generation. It is beyond stupid that we continue to expend money, lives and diplomatic capital over there. Haven’t we already screwed it up enough? @AG I suppose you think Dave is radical too. I’ve been trying to post a reply since yesterday but, for some reason the web page would not. I will assume it is my browser. Thank you Dave for posting my thought on the subject. Dave, I guess if you were around in the late 30s early 40s you would have been OK with Germany taking over Europe and the United States should have never gone to war with them. With nothing left to say, inevitably the ” But, but, but Hitler! !” response comes out. As sad as it is predictable. To be fair, when having a conversation about war policy and the politics behind it, you’d have to imagine Godwin’s Law would pop up much sooner than in any other conversation. The basic premise of Paul’s question remains though… when does a just society have an obligation to intercede for those being oppressed in another society? We can let things fly like laws forbidding women to drive, but do we start wondering when it gets to genital mutilation? Maybe not when you have political assassinations but how about “ethnic cleansing” or the mass murder of an entire specific population? When does one state invading another state constitute an aggression to be answered by the world powers? Is there a line, and where do you draw it? I think the US has fumbled that question many times in the past. I think the problem with US policy is that it picks and chooses when to encourage democracy or permit human rights violations, so it inevitably loses credibility. For instance, US supported a blatant military coup of democratically elected Morsi in Egypt all the while pushing for democracy in the Middle East. Once Morsi was replaced by Sisi, Sisi has used brutal tactics shutting down any form of rebellion against his regime including mass death sentences with no trial and mass killings of protesters. This behavior by our ally Egypt is worse than anything we have seen come out of Iran in quite some time. Completely hypocritical and an example of the US speaking out of both sides of its mouth. For a while now the US has fought for human rights on a needs basis and will look the other way if it benefits its own interests. All of this is reasonable btw, but when we play “the moral superior” card its hard not to see this reality. Will, I largely agree with everything you said. One point I’ll mention though is regarding the Egypt situation, since it is a complex one. We said we supported democracy, even when it meant Morsi was elected but then we also supported his overthrow as well. But now we’re comparing the muslim brotherhood and Al-Sisi’s hardline tactics… both of which have been the cause of many many MANY deaths. Pretty ugly no matter what.